LLTS.ORG Fully Redesigned! And Our 100th History Article! What better entry for our 100th History entry than to announce the 2008 redesign of our web page that resulted in needing to edit and format the previous 99 entries, 55+ articles written about us, couple of dozen fantasy stories written by members and all of the other myriad of pages that made up the old site. The overall layout of our old site had been in place for five or so years. Content in that site went back more than 10 years in some cases. It had been added to and tweaked and upgraded and reformatted and manipulated many times over the preceding decade. It had several rewrites that put a new overall look to the site with the same basic underlying content. There were old java classes.. old sound files.. ancient graphics... some buried text that probably hadn't seen the light of day in years.. and much more that really needed an overhaul. 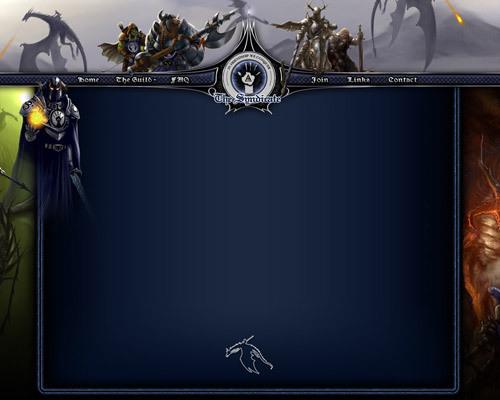 One of our Syndicate members (Derugash is his name in the guild) run a website design business. He offered to help redesign the page. So we began from the ground up with a completely new layout. What makes our 2008 layout special is that 100% of the artwork and graphics used are Syndicate property. None were borrowed from games or other sites. All were artwork we commissioned and owned yet the site looked very professional and like it could have had the art ripped from the highest quality websites of the day. The Syndicate's new design really took a major step forward in professionalism and quality. After a backup was taken, a massive purge of old content occurred. It was quite a walk down memory lane to look through the directory at some of the files that had accumulated over the years. Years ago we had a vendor network in UO called the SVN. The old webpage for that was there. One year we hosted a public trivia contest for players and that old webpage was there. Random "midi" sound files from the very early years were there. What a mess... but what a fine set of memories it was. 12 years of Syndicate history all jumbled into that directory. As the file deleted ticked off one by one the dawn of a new chapter in the website history of the guild was dawning and the rewrite of 2008 was born. Here is how the overall layout of site looked after the rewrite in 2008... All of those graphics and images are snippets from Syndicate owned artwork..